– Alcatraz is home to the first light house on the West coast of the USA. The lighthouse which was completed in 1854 stands 166 feet tall. To warn ships of the danger, a heavy bell was added to the lighthouse which was struck by a mechanical hammer every ten seconds. – In 1862 a Union steamer by the name of Paul Pry hit Alcatraz Island and sank. – Al Capone was sentenced to ten years in Alcatraz for tax evasion. Al spent 4 and a half years on the rock. He was housed for a portion of his time in cell number 181. Prisoners on the rock were not allowed to keep gifts, but they were permitted to have musical instruments. While on the island, Al received a banjo from his wife and he joined a prisoner’s band. Another famous member of this band was, Machine Gun Kelly, who was said to have played the drums. – The famous Bird Man of Alcatraz, Robert Stroud, did not have any birds while he was on the island. He had kept birds and studied them while he was an inmate in Leavenworth. -The last prisoner to be sent to Alcatraz was Frank Weatherman. – One of the most famous escape attempts was made in 1962. Three prisoners, Clarence Anglin, John Anglin and Frank Morris were able to escape their cells and make their way into the air vents and then down to the shore of the island. The inmates had constructed a raft made from raincoats. The three men were never seen again. Investigations by the FBI were conducted and numerous tools and odd items turned up in the water, but they never found the men. Some believe that the men drowned in their attempt to cross the water, while others maintain that they make a clean getaway. -During its years of operation as a prison, there were 14 escape attempts. All the inmates were recaptured except for nine. Six prisoners were killed during their attempts, and three were believed to have drowned. Alcatraz ceased operating as a prison in 1963. The reason given for its closure was the expense of operating the prison. Due to its isolated location, all supplies including water had to be shipped to the island. The amount of repairs that the buildings needed, because of their long exposure to the salt air was deemed to be too expensive. Alcatraz was also responsible for dumping large amounts of sewage and waste into the bay. 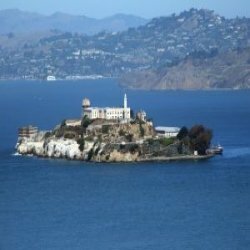 This entry was posted in Locations Trivia and tagged Al Capone, alcatraz prison, alcatraz prison trivia, alcatraz trivia, prison trivia, the rock, the rock trivia by Jane. Bookmark the permalink.